A familiarisation trip generally refers to the situation where a destination invites in media or influencers or writers or, alternatively, travel trade into the destination to showcase it and to allow those very important people to experience your destination at first hand. It’s to familiarise them with your destination. The Internal Fam trip is something different. This is where the operators within a destination get together and showcase the destination to each other. It also involves a whole day. It generally involves getting on a bus together and travelling around the destination having little snippets of the experience that a visitor might have. What are the advantages of an internal familiarisation trip? This week I had the great pleasure of hosting and organising one of those of behalf of a destination that’s really just emerging in Ireland in tourism terms. It’s the Shannon Estuary Way and it’s between counties Clare and Limerick. It’s an area that always existed and, much like the Wild Atlantic Way, it has repackaged and re-presented itself as a destination of singularity and distinction to the visitor. An important thing to remember is that before you can ever become a destination in a visitor’s mind, you must first become a destination in your own mind. That’s exactly what I find so valuable about internal familiarisation trips. 2. Pride: this is almost an inevitable consequence of this raised awareness. Your neighbours are surprised at the experience, and you’ve really opened their eyes. They’ve seen it for the first time as a visitor and they’re impressed! 3. Confidence: this comes with pride. 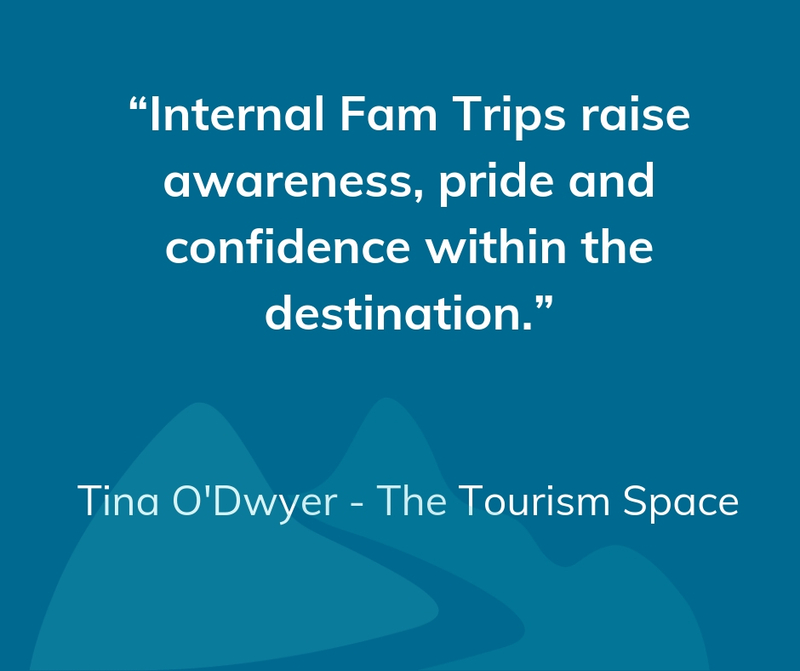 Fam trips raise everyone’s confidence of what’s on offer in the destination. Why is this important? It is important for driving referrals. Visitors are in your destination asking for recommendations of where to go, researching their next activity while they’re here. Giving your neighbours the confidence that what you do will deliver a positive experience for visitors will encourage them to give referrals. The referral you give based on your own personal experience is many times stronger than the one you give based on hearsay alone. 4. 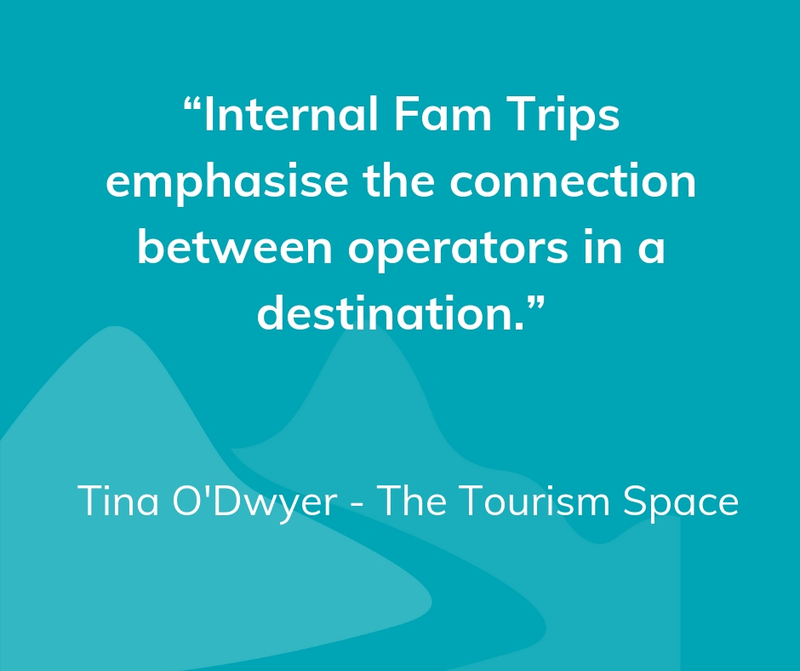 Connection: fam trips emphasise the connection between each of the you in the destination. You experience your place as a visitor would – you see what they see, you feel what they feel; you know what the highs and lows are and you know what connects well together. You can enhance and elevate the highs and you can start to address the lows. It emphasises for everybody how your success is co-dependent on each other. To repeat – in order to be a destination to a visitor, you must first be a destination in your own mind.I strongly recommend every destination to spend one or two days at the start of every season on a bus on an internal familiarisation trip.